When she showed me the quilts, I was moved to tears. What a labor of love! The cutting of material, the piecing of material, the quilting of the material! Yet what I found most interesting was that each quilt told a story. She could tell me the history of the fabrics, the story behind the quilting design, the people who helped her during the process. As she told the story, her eyes glazed over and she seemed far away. It dawned on me that she was remembering those days with a yearning for her youth. It also dawned on me that a complete stranger would only see the beauty of the quilt, not the history of its making. I bought both of those quilts to add to my collection of stories. They are like books in my library. When I want a good story, I pull out a book. But, with the quilts, when I want to imagine a good story, I can hold the quilt on my lap and shut my eyes, remembering the stories behind its creation. The next time that you visit Lancaster or Holmes County, stop at a quilt store and let your imagination run wild. Try to learn the history of the quilts…who made it and why? You’ll be surprised at how much you can learn about the Amish just from a few innocent questions about the creators of the quilts. 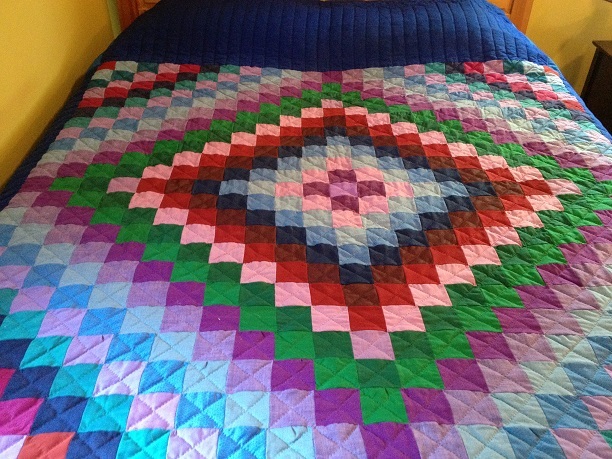 A beautiful quilt with vibrant colors. 🙂 I wonder where this one will lead you in a story. Enjoy. What a beautiful idea you had when you bought both quilts. I can imagine that we’ll be reading a new book with the stories of each quilt you bought. If I ever get a chance to go where I can buy an Amish quilt I will know to ask all kinds of questions. How wonderful it would be to hear the stories that come with the making of each and every one of them. The one in the picture has so many beautiful colors in it. .
Ah, Sarah, you’ve touched my heart again with your story about the Amish quilts. I bought an Amish quilt in Shipshewana the summer after my mother died, and that alone is a story. I’m a quilter myself, and can truly appreciate all of the work that went into those beautiful quilts that Leola made, and all of the memories that those quilts share. Thank you for purchasing them. The love will live on in your life as you treasure those beautiful quilts. Blessings! I would love to have a quilt made by the amish.I love quilts.The quilt in your article is beautiful…I love the colors.Thanks for your posts. What a beautiful quilt! My goal is to sew a quilt very soon. I have never made one other than a doll quilt for my daughter’s doll..